Welcome to our March newsletter! This month I've been thinking about ill health and end-of-life care for pets, which may seem like unusual and sad topics for a month in which Spring is bursting into life (in the northern hemisphere, anyway) but they're nevertheless important ones to think about for any cat- or pet-owner. The charming photo below, bursting with life and happiness, was posted on our Facebook page and reminded me strongly of the very first cat I ever owned. And that sparked a train of thought that led to the main topic for this month. family shows off her 'Batman' climbing skills! A long time ago, when I was eleven or twelve, I was given a kitten. It wasn't a Siamese kitten; envious of friends who did have a Siamese kitten, I'd begged my parents for one, but there were none to be had where we lived so they found me a non-pedigree, tortoiseshell kitten instead. I gave my kitten a special name, but to be honest I now can't remember it because she instantly became known by everyone as Batcat because of her frequent habit of climbing the fly netting. We lived in North Africa at the time so there were plenty of flies, and Batcat, of course, loved chasing them. I had few close friends where we lived, so Batcat became a much-loved companion until the day when, playing outside in a small tree she'd climbed, she was stung by a tree scorpion - a sting that was to prove fatal despite everyone's best efforts to save her. 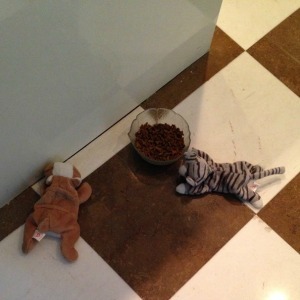 I was inconsolable, and cried for days. All of which was my first encounter with the love of an animal, and death and loss and the inescapable fact that the creatures we care for will someday leave us. In her book The New Boy, Doreen Tovey, herself no stranger to the loss of cats as she owned many of them in her lifetime, wrote that "the one disservice animals render us is that they don't live as long as we do". This means we have to get used to the fact that our animals will probably, at some point in our lives with them, get sick, or old, or die. We have a tendency not to want to face this possibility. It's sometimes easier to believe that our pets will always be with us and we put off facing the inevitable as long as we possibly can. However, it makes sense to give some thought to how you're going to care for your animals and handle this distressing time before it happens. How will you cope when your cat gets old or sick? 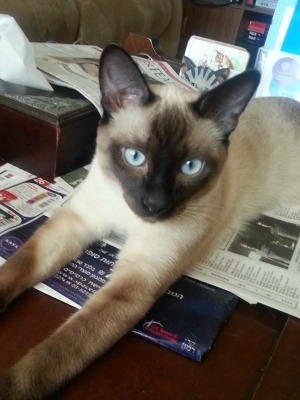 Coincidentally, earlier this month I was contacted by one of our readers, Judy, who sent me the story of her rescued Siamese cat Whisky Blue-Eyes. 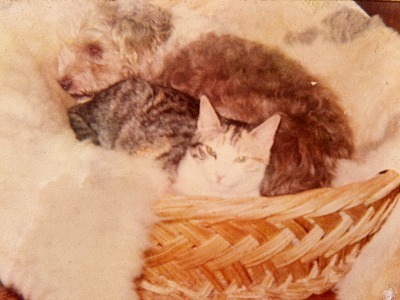 Whisky and his black-and-white companion, Blighty, came into Judy's life following the illness and death of Lotto, her previous cat. Judy's grief at Lotto's death affected her so deeply that she became ill, necessitating a stay in hospital. Our love for our pets is so strong, and our grief at their illness and loss often so deep, that we sometimes forget to care for ourselves while caring for them. Judy's story has a happy end, however, as she tells us about the antics of her two, new, rescued cats. New cats don't replace the ones who've passed on, but bring their own special energy, personality and healing into our lives. I recently came across a thoughtful little Kindle book called Promises To My Pet: A Guide To Planning For Your Pet's Care Before They Get Sick by Claire Gillenson, an intuitive coach who helps others get through loss, pain and suffering. The idea for Promises To My Pet came to Claire following a period spent as a voluntary worker in a hospice. Here, she became familiar with the 'Five Wishes Directive' that allows patients to decide in advance what type of care and treatment they want towards the end of their lives, guiding their family and doctors to make these choices for them once patients are no longer able to take these decisions for themselves. Claire extended this idea to pets, and her easy-to-follow Kindle book has us think through in advance what we would like to happen to our pets when they become sick. This allows us to make rational decisions for the future at a time when our pets are healthy and we're not facing the emotional trauma of potential loss, and provides a framework for our vets and ourselves to follow on how to proceed when things become difficult and stressful. Promises To My Pet begins with thoughts about daily care and budgeting for everyday items, vet visits, and emergencies, follows through with the comfort of your pet as it ages and what you would like to happen in the case of illness or the need for treatment, and ends with how you would like to handle euthanasia and afterlife issues such as funerals, burial or cremation. Promises To My Pet is currently only available in Kindle format on Amazon, but is well worth a look if the idea of the book appeals to you. 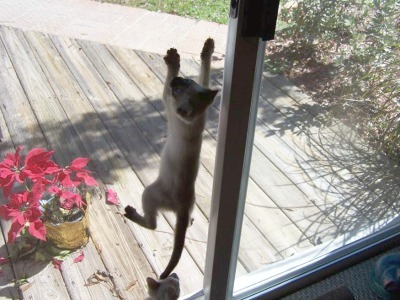 Our Meezer of the Month - unusual behavior from our Facebook page! Our March Meezer of the Month is Willow, seen above on the left in a yoga pose familiar to all of us! Willow, who belongs to Susan, a regular visitor to our Facebook page, has the unusual habit (or perhaps not so unusual, as comments from other visitors showed) of bringing her Beanie Babies to dine with her. At mealtimes, she brings them to her food bowl, positions them with their heads facing towards it, and then after dinner she takes them away again. Last year I dedicated a whole newsletter to the sometimes strange antics that our cats get up to - you can read it again here. That's all from us for now, but we'll see you at the end of April and meanwhile, have a great month! Below you'll find a few of the cat shows coming up. If you're involved in organizing, or showing your cats at, a show that isn't listed, please let me know and I'll include it in the next newsletter.